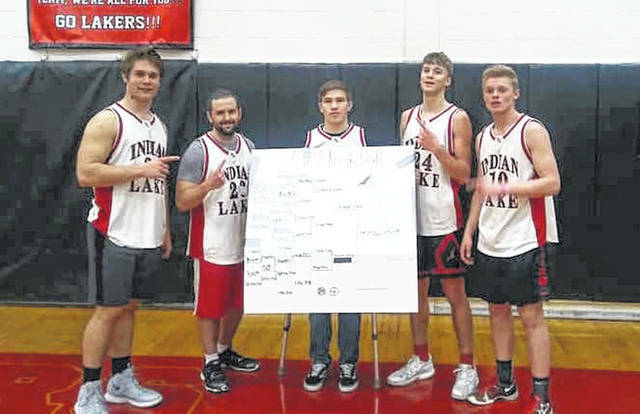 Indian Lake High School Youth Leadership students held their version of March Madness, with teams facing off in the second annual 3-on-3 Basketball Tournament to benefit the Logan County Vets to DC trip. The team called Kendryc’s Ghost prevailed. Team members were, from left, junior Nate Reichert, ILHS math teacher Troy Shively, sophomore Lane Mefford, junior Austin Parker and junior Clay Jacobs. The tournament raised $250 for the program.